Is there genuine joy of giving in the way I handle Christmas shopping and gift-giving? What do I need to do to make my Christmas giving a source of joy for myself and others? Painting contributed by Shannon Maddox. Shannon is an artist and musician who lives in Alabama. She blogs about health, crafts, art, and life at Iron Diva. Join us this season as we pray through Advent together. 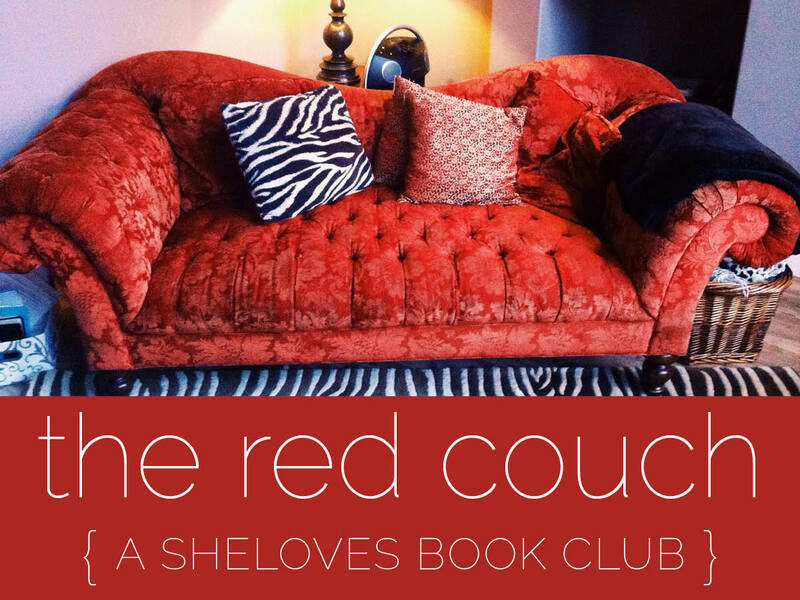 I have some beautiful guest posts and there’s space for your voice, too. I hope you join us – either by contributing or on your own. 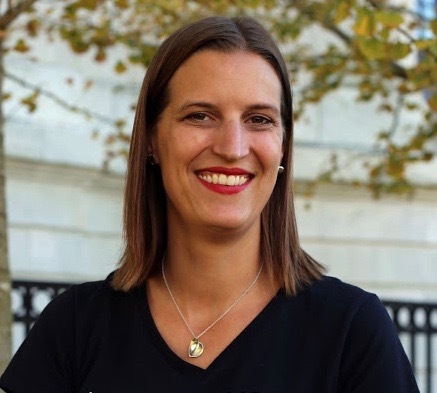 Today’s Strong Woman is Shannon Maddox, my first blogging friend. 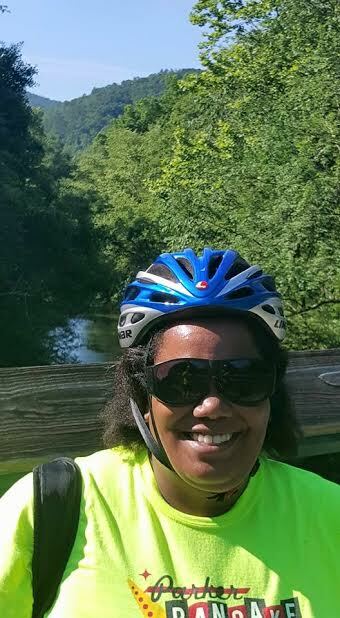 Shannon, aka “Auntie,” is a writer, artist, and musician whose 9 to 5 …well actually 5 to 9… job is as a Member Care Specialist at her local YMCA. Her blog, The Iron Diva (www.iron-diva.blogspot.com), chronicles her ongoing quest for total health (and anything else that may be swilling around in her grey matter). She resides in Weaver, Alabama. Thanks to my sister-in-blog, Annie, for the opportunity to share. When I looked up the word strength in the dictionary, among every definition was a common theme—power. Power conjures up the image of a superhero with superpowers. Most people would understand my power if I were a wife, a mom, or a CEO. But don’t be fooled, I have mighty weapons they in themselves don’t seem like very much, but they bring strength and courage to others. Picture in your mind a young lady pregnant for the first time with a child who wasn’t planned. Then picture a 30-something career woman who feels she doesn’t have time for a baby right now. Then picture a 40-something divorce’ pregnant with her fourth child. Her husband cheated on her, and she really doesn’t want any reminders of him to deal with. Now, bring her to a pro-life crisis pregnancy center. Not only does she get kind, loving words, but real help. The first gift she receives is a pair of baby booties. Why? She needs to know that there is a real little person with feet growing in her womb. Not tissue, not a cluster of cells, and not a mistake to be erased, but a real person to love. The baby booties give her power to carry her child to term and care for the child or lovingly give him up for adoption. I’ve made hundreds of pairs of booties for our local center and plan to make 100’s more. My crochet hook also brings comfort and strength to deployed or wounded soldiers, joy and strength to the elderly in nursing homes, and loving strength to children fighting illness. Nehemiah 8:10 says “…for the joy of the LORD is your strength.” Recreating the beauty of the world on a canvas or paper not only brings me joy, but shares that joy with all who will look. Art critics are notorious for saying that a piece should “say” something. The main “statement” of my art is “Feel the joyous strength.” If I can’t relay that message, anything else I try to say will be lost. My paintbrush brings joyous strength to all who view it on my blog or social media pages, those who purchase or receive it as a gift, and to my local senior citizens center. I am on the lookout for ways that my paintbrush can bring even more strength to those who need it. I hold true to the old adage “The pen is mightier than the sword” though sometimes my “pen” is a computer keyboard. Words have power. Proverbs describes words as having the ability to build or tear down. The Bible also says that words reveal the true nature of the heart. I try to use my words to build up the good and tear down the evil. Others have found strength through the words of my blog or essays I’ve written. Some found strength to keep fighting for their health, while others have taken up the “pen” themselves to pass on their own version of strength. For those who only see one kind of power, my weapons may seem flimsy and not up to the task. For those who truly understand that power and strength come in multiple forms, my weapons are mighty indeed. One of my favorite memories growing up is sitting in front of my dad’s reference books in his home studio, looking through his Jansen’s History of Art while he drew. It was from his college days and the photos reflected its publication date. I remember looking at an image of the Sistine Chapel ceiling and talking with him about the restoration process. I couldn’t wait to one day travel to Rome myself to see the newly refinished vivid colors of Michelangelo’s masterpiece. Browsing those reference books changed my life. In a very obvious way, they sparked an interest in art history that took me to Paris for four years, which in turn fed my love for travel and exploring different cultures. This worldview spilled into my second grade classroom, provided opportunities to work at a museum here in Denver, and has guided how we parent Bea. In a more subtle way, those books gave me deeper empathy for the world around me. By looking at images of history, I looked through new eyes at what I was learning in school and reading in the newspaper. From Greek Antiquity and the Renaissance to Monet’s early picnic scenes and Duchamp’s ready-mades, I saw my own world through a new lens. Our house is filled with art and we’re hoping to add to our collection. Most of the pieces we own were bought on travels, created by artists we know personally, are prints of exhibitions I went to in college, or murals my dad painted. The art in our home tells our family’s story – one of relationships and exploration. 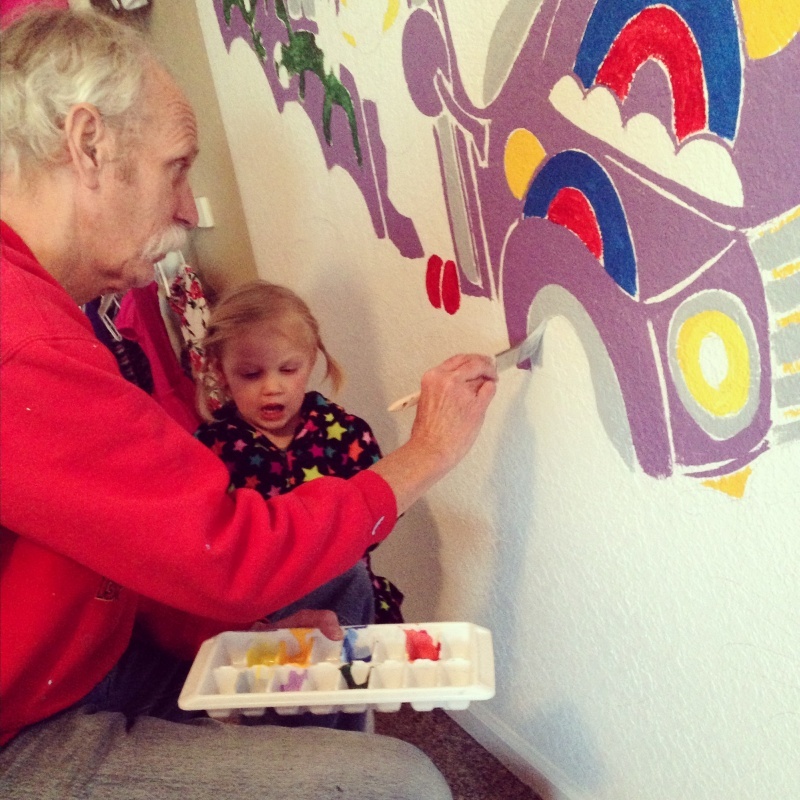 Instructing Grandpa on her bedroom mural. This art is not only a tangible way to tell our own story, but I hope it plants the seeds of curiosity and wonder as our girls learn to recognize the places and artists they represent. I keep my art history books on low shelves around the house and Bea has her own small collection of books for children. She recognizes some famous artists and the idea of creating a mural or project is part of her daily vocabulary. As she creates, she narrates the story of her day or recent events – on some level, she already understands the storytelling aspect of art. One of the most important things I learned when studying art history was how to stop and look at a painting. I might not know all of the deep symbolism or exactly what was happening during that time, but I did learn to “read” a painting: To start in a corner and let my eye move across the canvas. I learned to research the questions I had and how to find the answers that helped make the art come alive. I wonder if we looked at the world in the same way if we could avoid many conflicts. Perhaps we need to stop, take some time to really look at a person or a situation, go find the answers to our questions, and then come back again. If we slowed down and really took the time to know others, to know stories, would we be as quick to jump to our own conclusions? Art builds bridges – between whole cultures as well as individual stories. One of my favorite moments when I’m talking with a group of kids about the art of Clyfford Still is when they suddenly make a link to their own lives. They are no longer seeing a large canvas filled with color, but an emotion in which they can relate. Part of the Abstract Expressionist movement is helping the viewer look inward – that art doesn’t have to be a specific moment in history but can be a specific moment in your own life. It’s not taking the art or artist out of context, but bringing your own life experience into a more global idea. What I love most about that movement is the ability to see our own story in the work of an artist. I’m learning to translate those ideas to my relationships and the way in which I read the world around me: To stop and find my own story within a larger context. How has art affected your worldview? What have you learned from someone else’s creation? Linked with The High Calling’s community theme: Art Matters.